I always know that it’s time to get a haircut when I begin spending way too much time getting ready in the morning. My hair has just a slight wave to it, so very unexpected things start to happen when it grows out a bit. This morning, my once trendy style with the shaggedy flippity-do was beginning to make me look like I’m a throwback to the 70s era Farrah Fawcett. So this morning, with the help of my good friends–Mister Hair Gel and the Bobby Pin Gang–I was able to tame this mess so I can make it through just one more day. Sorry…no pictures of this one. Yes. That is Steve Buscemi. Hmmmm…I only just realized something interesting about these choices–the last three have the same/similar color palettes. I think I’m drawn to these orangey shades. The one on the left is a bit different. This guy does paintings on rocks. Some of them were illustrations on rounded river rock. This one that I’ve linked to is pretty interesting–I think it’s from a conglomerate rock that he broke in half so that the pebbles inside are protruding. He’s painted them to look like people and they seem to be struggling to emerge from out of stone. 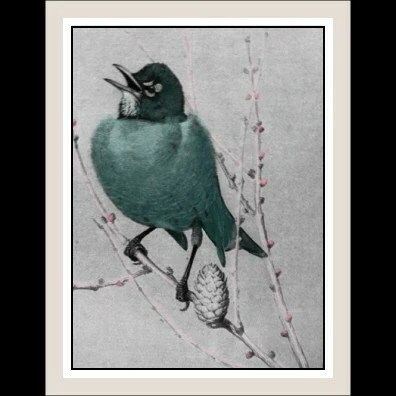 This little lovely was a picture that I found in a Vintage book on birds. I colorized and enhanced it in Gimp (free “Photoshop”). This entry was posted on March 23, 2007 at 10:34 am	and is filed under Uncategorized. You can follow any responses to this entry through the RSS 2.0 feed. You can leave a response, or trackback from your own site.